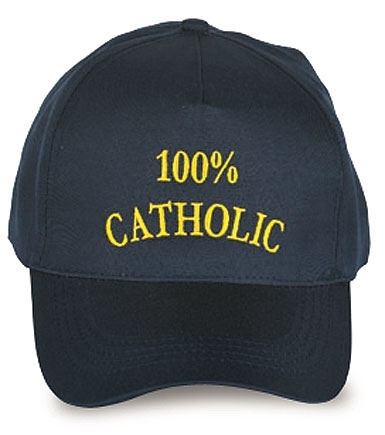 100% Catholic-Cool line of merchandise featuring the "100% Catholic " logo. Proudly proclaim your Fatith with these cool items - Here is what the Catechism teaches about the importance of evangelizing: The New Evangelization calls each of us to deepen our faith, believe in the Gospel message and go forth to proclaim the Gospel. The focus of the New Evangelization calls all Catholics to be evangelized and then go forth to evangelize. In a special way, the New Evangelization is focused on 're-proposing' the Gospel to those who have experienced a crisis of faith.Pope Benedict XVI called for the re-proposing of the Gospel "to those regions awaiting the first evangelization and to those regions where the roots of Christianity are deep but who have experienced a serious crisis of faith due to secularization. "1 The New Evangelization invites each Catholic to renew their relationship with Jesus Christ and his Church.